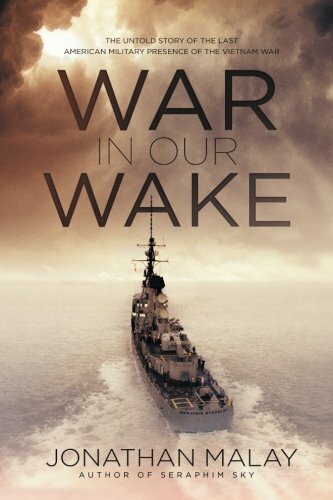 War in our Wake: The Untold Story of the Last American Military Presence of the Vietnam War. By Jonathan Malay. Bloomington, IN: iUniverse, 2017. Let me say up front, I have been a friend and colleague of Jonathan Malay for more than two decades. He and I served in the governing body of the American Astronautical Society together, and enjoyed company at professional gatherings and society events. I knew he had been a metrological officer in the Navy and had worked in related areas in the space community thereafter. I did not know the story that he tells in this truly enlightening and evocative book. This is the story of Jonathan Malay’s Navy experience as a young officer aboard the U.S. Navy destroyer USS Benjamin Stoddert (DDG-22) at the very end of the Vietnam Conflict. The American withdrawal of troops from South Vietnam had taken place in 1973, but the process of Vietnamization had not gone smoothly. In the spring of 1975 the last Americans departed as the soon to be overrun nation as North Vietnamese forces reunited the country under Ho Che Minh rule. The Benjamin Stoddert represented the last American military presence of the Vietnam Conflict. The Benjamin Stoddert was in Vietnamese coastal waters on May 3, 1975, engaging in rescue efforts for those trying escape the fighting. Malay tells this story in stunning detail, with a touch of pathos and a large dose of catharsis. It had always bothered me that the United States abandoned the South Vietnamese allies in 1975, and the fate of the boat people and others is not one of America’s shining moments. Malay brings those feelings back by capturing this story of escape and humanitarian action that saved too few but was nonetheless a start. Vietnam is one of the most exotic and picturesque lands in the world, and Malay describes it well. He captures its essence, and the tragedy of a war that could have both been avoided with effective diplomatic action and won had the U.S. demonstrated the will to do so. This entry was posted in History and tagged Ho Che Minh, iUniverse, Jonathan Malay, Saigon, USS Benjamin Stoddert, Vietnam, Vietnam War, Vietnamization, War in our Wake: The Untold Story of the Last American Military Presence of the Vietnam War. Bookmark the permalink. Regarding VietNam: I watched a trailer video of the upcoming Ken Burns multi-part documentary on PBS starting in September. Should be a very interesting documentary.